Stretch out rich harmonics from acoustic sounds. Turn field recordings into ambient soundscapes. Or bring in synth sounds to be shredded, exploded and recombined with intricate patterns and cloud effects. Demo version cannot save presets or DAW state. Further questions can often be answered here. VST, AAX & Audio Unit plugins, in both 32 & 64 bit. No standalone version. Pro Tools 11 required for AAX. OS X Snow Leopard 10.6+ or Windows 7+ required. 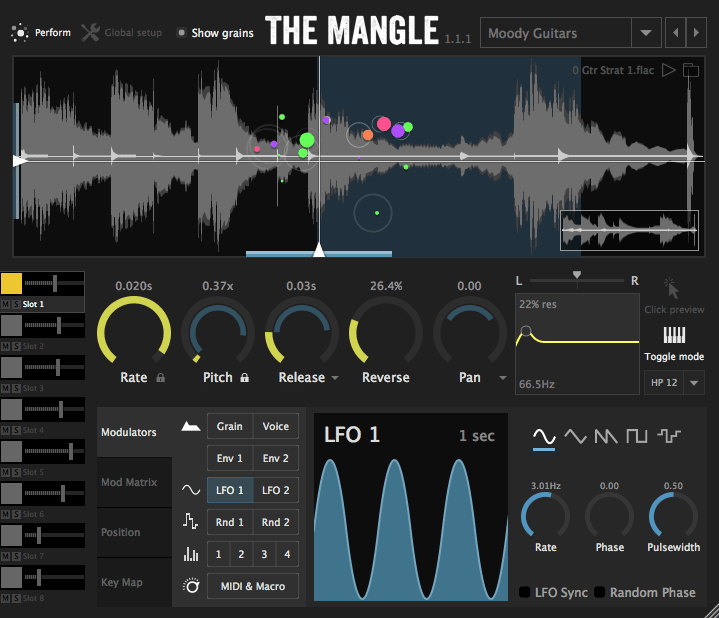 The Mangle's beautiful streamlined interface makes it a joy to use. The real-time animation of every individual grain is mesmerizing, and the ability to stretch a single sound into tiny harmonic particles is wonderful. I can already tell this is going to be one of my favorite tools for sample manipulation! Visualize your grain stream. Individual grains move across the waveform in real time. Amplitude, pitch and envelope are also represented. Creating new modulations is easy - just drag the modulator to its target, then set the amount with in-place markers showing changes. 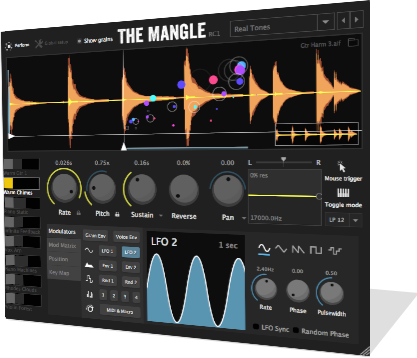 The Mangle's interface is rendered dynamically as vectors - resize it with no loss in quality. Handy for live performance. The Mangle is also great for making rhythmic patterns. Four sequencers can be used to modulate any parameter. Quickly and easily see where high, mid and low frequencies are in your audio, for clearer sound setup and tweaking. Each instance of the plugin has 8 full 'slots' each with their own audio & parameters. Map them to any MIDI range for multi-timbral patches.